In the beginning it was Masetti. In Rua Freda 21 where there is still the ancient name "Liuteria". This ancient Modena's family had made violins, violas and guitars for 3 generations by the magical hands of the brothers Primo and Romolo, the sons Renzo and Valter, his nephew Roberto. In this lab at the end of the thirties the famous guitarist Romolo Ferrari had created a club where they met musicians and luthiers of Modena. 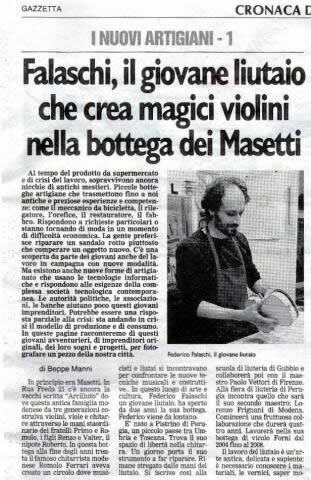 In this place of art and culture, Federico Falaschi a young violin maker, opened his first shop for two years. Federico comes from afar. He was born in Pistrino in the province of Perugia, which he left after his studies, he worked in a company as an employee. He is not satisfied. He finds his freedom in the guitar. One day he takes his instrument to be repaired. He remains bewitched by the hands of the luthier. He is 25 years old. He attended the Violin Making School in Gubbio and later collaborated with Maestro Paolo Vettori in Florence. At the violin-making trade fair in Perugia he met the man who will be his second master Lorenzo Frignani of Modena. It was a fruitful collaboration that will last for five years. He will work in his shop in the via Forni from 2004 until 2009. The luthier work is an ancient art, delicate and wise: you must know the materials, varnishes, knowing how to shape the wood and the music. Falaschi makes string instruments: violins, violas, cellos and classical guitars, he repairs and makes maintenance. He makes even ten instruments for year. The Federico's lab is a magical place, tidy and bright. Magical as its name that refers to ancient fourteen century sounds. A display case with his first violin, sober posters, paintings by artists. The work bench facing the road. Today it is quiet but 50 years ago it echoed the words of passers-by, with the noise of the tools of the craftsmen who flourished in a popular district of Modena. Federico is creating a violin, he has already carved the neck modelled the back and sides. He is gluing the soundboard. 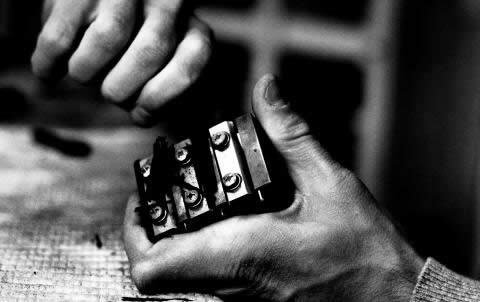 Then he is adding the keyboard and ebony pegs. The alcohol varnishing is a long and delicate work. "The violin is a perfect instruments, it multiplies the sound transmitted through the ropes rubbing controlled and amplified by the soundboard. My work requires calm and reflection", confesses Federico "I like it because I can express what I think. I need to check my gesture and this requires the knowledge of myself". In Perugia, and in general in the Umbria region, the violin making, namely the construction, restoration and repair of musical instruments, has never had an important tradition. A few years ago in the Rocca Paolina, in the historic center of Perugia, a beautiful exhibition of professional musical instruments was organized. Unlike other fairs, the atmosphere was cozy and pleasant thanks to the division of space and above all to the magic of the place. Unfortunately, the 'Perugia Classico' no longer exists. The Luthier Federico Falaschi, in his lab in Pistrino near Perugia, proposes a new style in his violins and his guitars, linked to the Italian classical tradition that comes from the knowledge and the study of important luthiers of 700 and contemporaries. Musicians and students in Perugia seeking sound quality and aesthetic taste, can find in the violin making lab of Federico Falaschi a sort of added value, professional service, a suitable musical instrument.